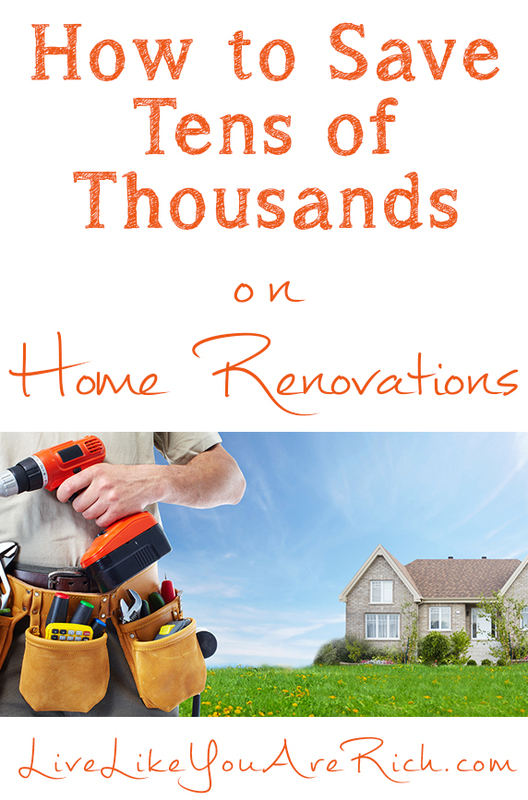 Most DIY bathroom renovations cost upwards of $10,000.00—especially when they include new plumbing and installing a shower, tub, vanity, toilet, and flooring. Here’s how I did mine for under 9% of that figure. 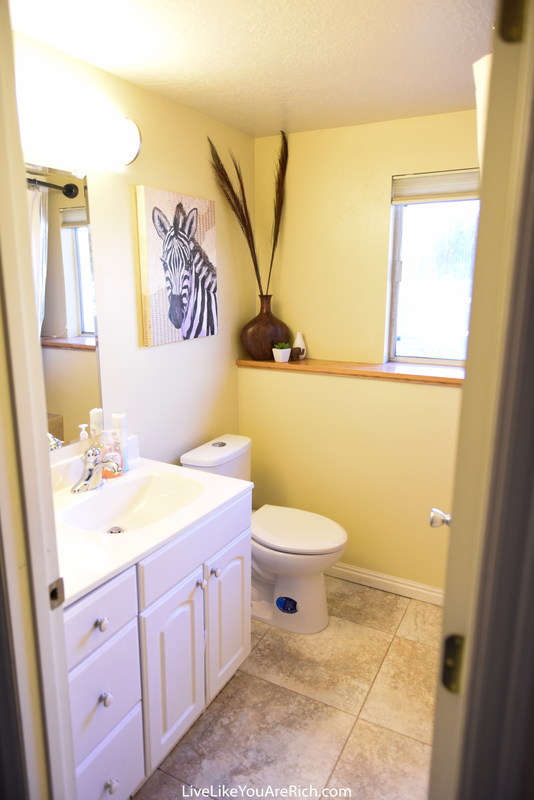 The guest bathroom needed an entire ‘gut remodel.’ There was no tub, shower or plumbing for it. And no flooring. Everything was outdated and old. This is the before photo. Unfortunately, I don’t have a picture of the other side of the bathroom, just picture a cement floor and bare walls with laundry hook ups. I paid a plumber to come in and jack hammer a hole into the cement and run a shower and bathtub water line. He charged about $350.00. That’s pretty inexpensive. He is a family friend and plumbed 6 rooms in my house, so I got a great discount. I’m sure there are plumbers in Los Angeles, San Francisco, Chicago, and other big cities that can provide even deeper discounts. Next, I found a used tub on the local online classifieds: $25.00. I got the shower head/faucet and handles etc. at a discount store new for $55.00. I found Italian tile remnants for both the flooring and shower on the local classifieds. The tile plus the grout was about $150.00. I borrowed a tile saw from my dad. You can rent these from home improvement stores if you don’t have access to them. I found that tile is quite easy to install/DIY if you are precise, patient, and have a good blade! The vanity (faucet, sink, and cabinet) was $50 used on classifieds, but I sold the old one that was in the bathroom for $30–net $20.00. 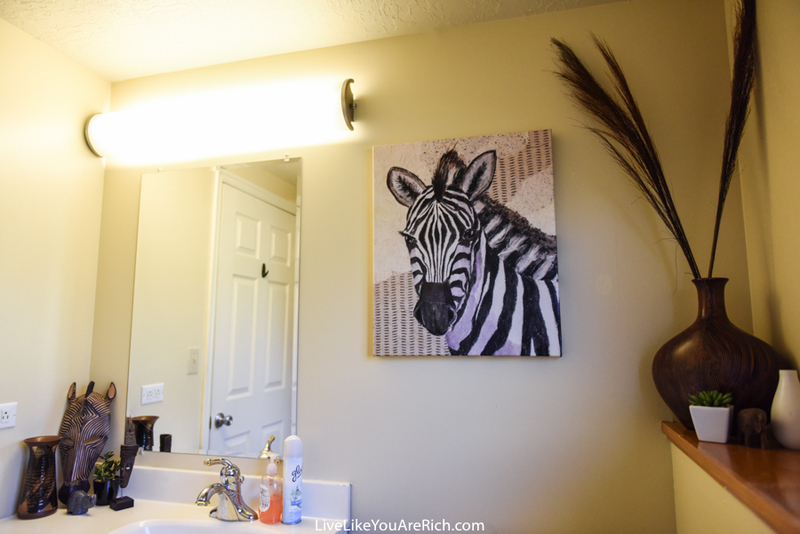 Brand new bathroom light was found at a garage sale for $3.00. The paint was a mis-tinted gallon for $1.00. Curved shower rod was $25.00. Bendable shower rod for the shower liner: $75.00. 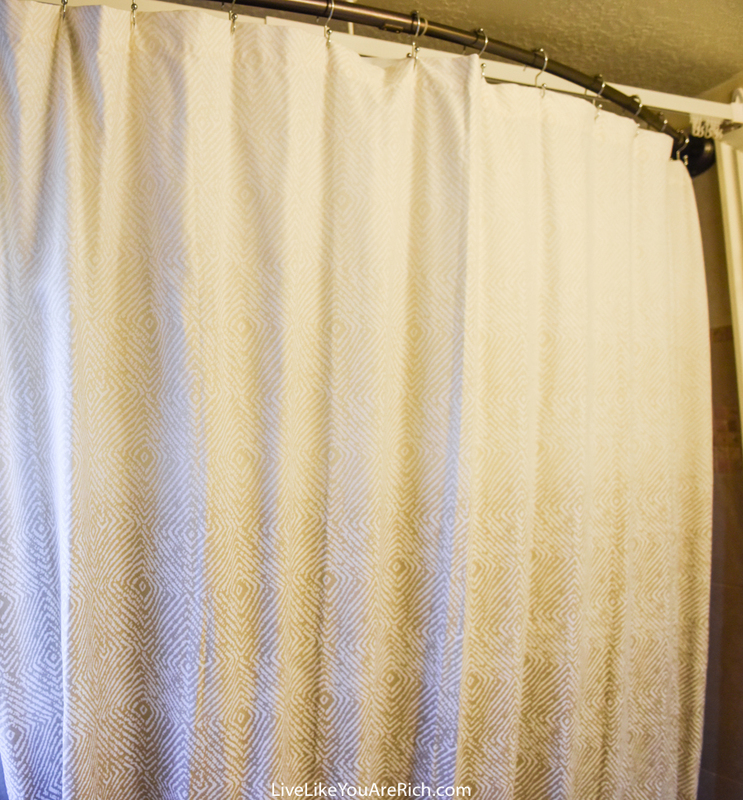 This bendable shower curtain rod is great for weird/non-standard sized bathtubs and showers! I found the majority of the decor, including the Zebra head mask, vase, and other knick knacks at garage sales. Here is a tutorial on how I score such amazing finds at garage sales. Total: $11.00. Entire remodel and decor totaled $859.00! 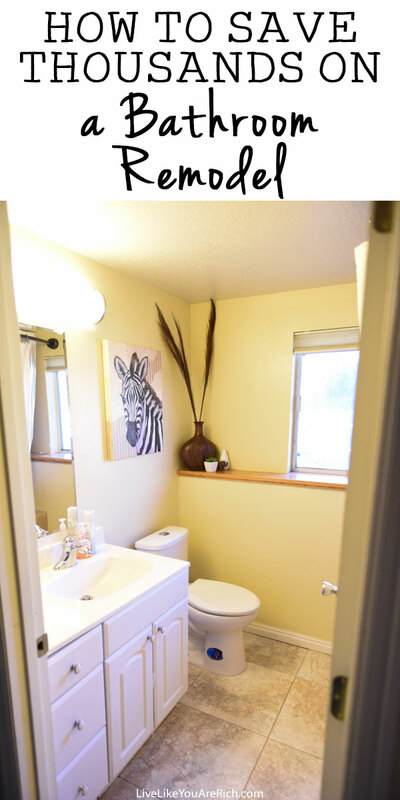 When using principals of thrift, it is possible to have a fairly nice bathroom for under one grand. For other ‘rich living’ and money-saving tips please subscribe, like me on Facebook, and follow me on Pinterest and Instagram. 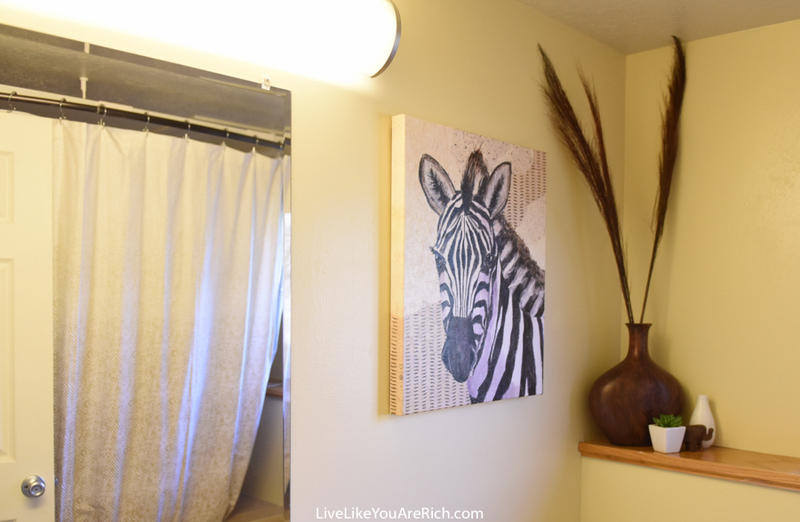 You always have great remodeling tips! 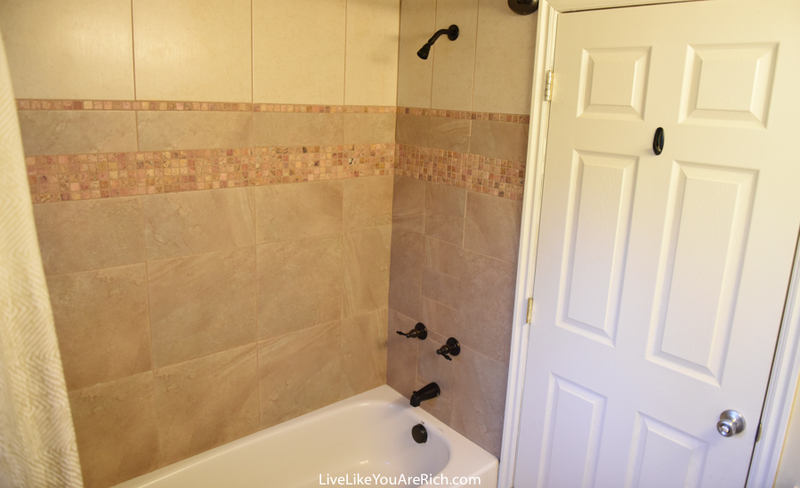 This is timely since we are going to start remodeling our house soon, and the first thing we plan to do is install a shower in the basement bathroom. Thanks for sharing how you saved so much money! You’re welcome! Thanks Charlee!! Good luck in your remodel! Wow, great job with the saving! It seems like the key to saving money on home renovations like this is to be resourceful and determined to find a deal. Not only that, but establishing connections and fostering relationships with people who can get the work done will be a benefit to both of you, especially if you end up renovating multiple rooms. Thank you John for the comment. yes being resourceful is a great way to save! 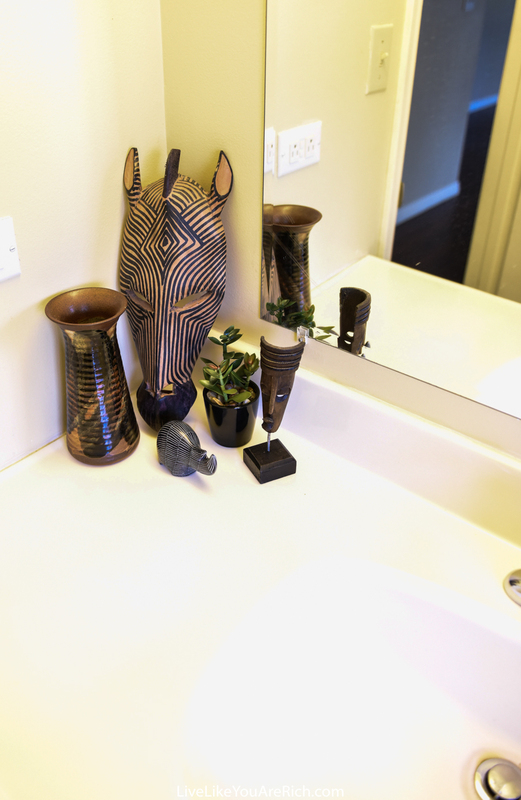 Thank you for adding in the part about the accessories you bought to really personalize the space, that’s often left out of bathroom renovations. This was great! I will be pinning this to my bathroom remodeling board! Thanks! You’re welcome Jennifer. Thank you for stopping by and commenting! Hey very nice website!! Man .. Beautiful .. Superb ..
i’m doing a bathroom re-model right now. 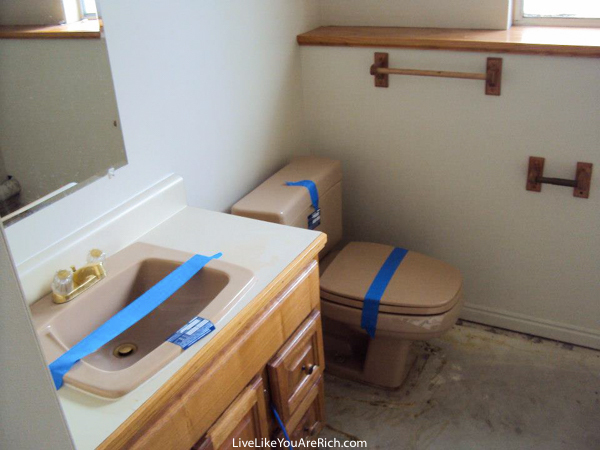 where did you find the deals on the vanity, sink, faucet, and commode? also, where did you go for instruction on tile work? I bought them off of a local classified called KSL.com it is similar to Craigslist. I watched YouTube videos on laying tile. Recently I retiled my other shower and rented a tile saw from Home Depot. I’d recommend that because the blades are really sharp and they take good care of their saws.